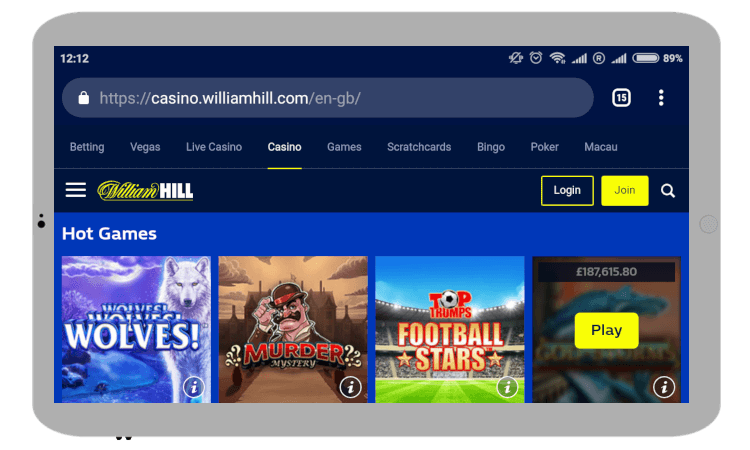 UK bookmakers can go either way, but William Hill’s online casino impressed due to their expanded games library, top payment methods and many other features. However, it’s not all plain sailing within our William Hill Casino review – with one of two sticky situations. Read on to find out whether they’re dealbreakers. N/A – There is no promo code needed at William Hill Casino. However, you must make sure to opt-in to not miss out on the offer. There aren’t free spins of any kind involved in the sign up offer, sadly. However, you may well be able to find some within the Promotions page (see below). This bonus arrives with a number of terms and conditions as standard. This is where the Professor is really on guard when reviewing his online casino sites, as it is often the make or break section. A minimum of £10 is needed to trigger the bonus, and you must opt-in. This is only available once per customer, and only to players new to the Casino section. Game weighting can vary, so check the site for more details. Although the x40 wagering is acceptable, beware of two key points. Firstly, the £2,000 maximum cap on winnings from the bonus is a little disappointing to see. But more importantly, your bonus can only be used on games under the “Casino” page – which excludes “Vegas”, “Games”, “Live Casino” and a few others. As William Hill Casino like to mix online slots between these pages, there may be a few titles that aren’t eligible for the bonus – so make sure to check! In addition to the welcome bonus, there are further promotions and offers available on the site. These will fluctuate over time, but the Professor managed to pick out a few examples for his William Hill Casino review. The actual campaigns may come in various shapes and sizes, but there are often free spins, cash and special chips to be won. These promos switch every few weeks to keep you interested. Going one better is the special tournaments for cash jackpots. Earn tickets as you play for real money to be in with a chance. Now, here’s a slightly odd one – a special VIP loyalty scheme for Live Casino only. But the one problem? You need to be personally invited to join. However, it’s stated that the “VIP service is designed for higher-stakes and frequent players”, so you don’t necessarily need to be ushered in. One of the first things the Professor noticed when completing this William Hill Casino review was the sheer number of payment methods on the table. You can see them all at the top of the page, but the classics such as Visa/MasterCard/Skrill/Neteller are joined by the localised Sofort/Instadebit/POLi/QIWI. We’re also happy to confirm that they’re one of the esteemed PayPal casinos too – so eBayers are in good hands. Yet, a couple of unique alternative payment options exist as well. First, there’s William Hill’s Plus Card. It’s a physical card (and mobile app) that you can link to your online account to then use in a land-based shop. Anything you win will automatically be transferred back to it – while you can also make withdrawals using it in-shop too. 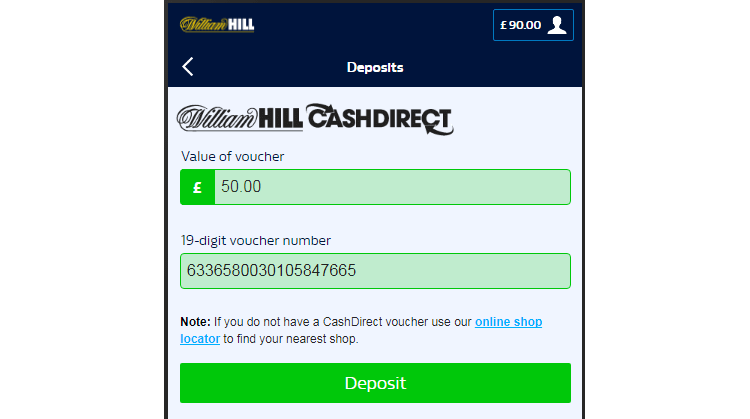 Then, William Hill CashDirect is a voucher you can purchase in-shop to fund your online account. Simply head into your local store, pay via cash or card and then log in and type the unique 19-digit code. If you deposit using this method then you can also withdraw using it too. Select CashDirect from the withdrawal options, make a note of the new 19-digit code and quote it in-store. NOTE: These options are only available to UK players. One of the most common queries is how long is the withdrawal time? Well, if it’s your first withdrawal, a large withdrawal or the first time using a different withdrawal method, you’ll be asked for identity verification documents. William Hill’s verification necessity is a standard procedure across the board – enacted for all UK online casinos. The Professor used all three options while conducting his William Hill Casino review. If you’re wondering why eWallets aren’t instant like many others, that’s because this withdrawal time includes the initial approval process. Our readers will be pleased to know that there is a significant number of online slots available here. In addition to these popular video slots, you also have table games (like blackjack and roulette), poker and card games, and progressive jackpots. However, the website’s structure is a bit different to what you’d expect. Rather than housing all of the above under one section, William Hill’s slots and games are split between many sub-sections. Therefore, you may need to chop and change to find exactly what you’re after. NOTE: Again, please be aware that the above bonus is only available for games found under Casino. One of those sections is Live games, with the Professor’s William Hill Casino review of this area being particularly positive. As mentioned above, there are dedicated bonuses for Live game players and even a separate loyalty scheme. Plus, you can find the usual games – roulette, blackjack, baccarat, poker etc – alongside the more obscure, such as Football Studio. The platform’s mobile casino options are pretty good. They have a mobile optimised site which is compatible with all devices (iOS, Android, Windows), so all you have to do is access it via your preferred mobile browser. You can easily switch between all the different gambling avenues that they have – while there are plenty of William Hill games on mobile to enjoy as well. If you want to download the experience directly to your device, there are several William Hill apps for both Android and iOS. In fact, there is pretty much a different app for each gaming section, rather than a one-download-for-all file. This has positives and negatives. It may save your storage space by not including gambling you’ll never consider. But on the flip-side, you may have to install multiple variations which isn’t ideal. Whichever route you take though, this is a good mobile casino choice. The history of this bookmaker is quite something, with the company being founded all the way back in 1934. Of course, the online casino didn’t follow until around the turn of the millennium – but they grew considerably to become one of the most recognised names around – who also float on the London Stock Exchange (WMH). This gives you a good idea of their credibility, but is William Hill safe to play at over the internet? Well, they have SSL-encryption which means that your personal data can never be seen by anyone other than them. In addition to this, the most reputable gambling licences and a very comprehensive customer support service are in place. On that note, they currently have two gambling licences – one from the Gibraltar Gambling Commission and another from the UK Gambling Commission. Both of these certificates guarantee that this platform is held to the highest standards, ensuring player protection. They haven’t been shy to act either, with the UK Gambling Commission issuing a fine to the bookie of £6.2 million for systematic failures about money laundering and problem gambling. The bookmaker responded by stating that they were “introducing new and improved policies”. Whilst this doesn’t sit too well with the Professor, he wants his William Hill Casino review to be as open an honest as possible. Also, it is their only current blemish in the eyes of the Gambling Commission. Live chat and phone are available 24/7, with social media on reduced hours as you can see from this Tweet. You can also leave your own feedback if you wish. Unfortunately, there are a fair few restricted territories/countries. They are Afghanistan, Algeria, Australia, Bangladesh, Belgium, Benin, Botswana, Brazil, Bulgaria, Burkina Faso, Cambodia, Cameroon, Central African Republic, Chad, China, Cuba, Cyprus, Czech Republic, Côte d’Ivoire, Denmark, Djibouti, Equatorial Guinea, Estonia, Ethiopia, France, French Guiana, Gabon, Gambia, Greece, Greenland, Guadeloupe, Guinea, Guinea-Bissau, Haiti, Hong Kong, India, Indonesia, Iran, Iraq, Israel, Italy, Lesotho, Liberia, Libya, Mali, Martinique, Mauritania, Mongolia, Montserrat, Myanmar, Netherlands Antilles, New Caledonia, Niger, Norfolk Island, North Korea, Norway, Philippines, Poland, Portugal, Rwanda, Réunion, Samoa, Saudi Arabia, Singapore, Solomon Islands, Somalia, South Africa, Spain, Sudan, Suriname, Swaziland, Sweden, Syria, São Tomé and Príncipe, Thailand, Togo, Tonga, Turkey, Uganda, United Arab Emirates, United States, Uruguay, Vanuatu, and Yemen. If you currently reside in any one of these locations then we’re afraid you won’t be able to play. William Hill Casino have really upped their game in the last few years, diverting their gaze purely from sport to my favourite – casino. Although the layout of the site is a bit odd, there are some real positives of playing here. Grab yourself a decent bonus to begin, and give one of the UK’s most famous bookmakers a try. Oh, and once you have, come back to give us your own William Hill Casino review.